Alcester's Dave Ashby in the thick of the action in the 2nd XV fixture. A DEPLETED Alcester side gave a good account of themselves in defeat against a high-flying Ledbury team who completed the double over the Kings Coughton men on Saturday. The visitors faced a selection dilemma, particularly in the backs due to injuries and unavailability, which led to them only having forward replacements, limiting their options from the bench in other areas of the field. However, Alcester started brightly enough and took an early 3-0 lead from a Max Biltcliffe penalty, which Ledbury replied to not long afterwards with a penalty kick of their own. The Herefordshire side started to take control of the game and, after their right winger had chipped over the Alcester defence and caught his own kick, he scored the first try of the game, from which Ledbury never looked back and the home side led 20-3 at the break. In the second half Alcester were more competitive. Spurred on by their dominant pack, they took the game to Ledbury and scored a try of their own through Matt Johnson who was at the back of a forwards drive as they marched towards the line. Both teams lost players to the sin-bin in the second half, with the visitors having Tommy Wright and Lewis Walker yellow-carded for technical infringements on separate occasions and a Ledbury player sin-binned for a no-arms tackle. Alcester laid siege to the Ledbury line and could have scored further tries but, in the end, a breakaway Ledbury score against the run of play sealed the outcome. 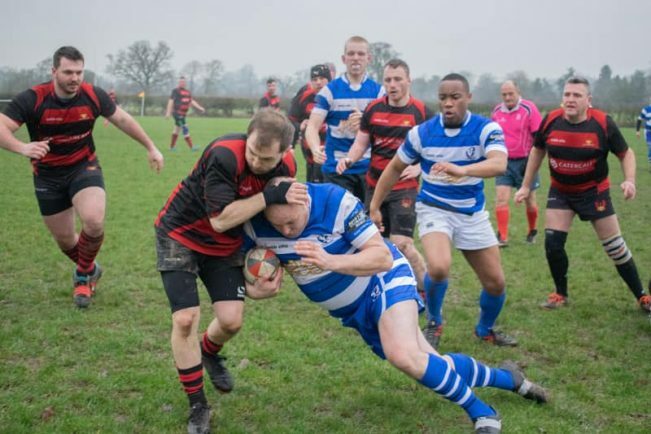 Try-scorer Johnson was named man of the match for Alcester, who continue league action on Saturday at home to Nuneaton side Manor Park, hoping to avenge a defeat earlier in the season. ALCESTER struggled with availability as a club last weekend but managed to field 14 players for their second team after calling on some retired legs. The visitors came short of players too but were a much younger side and both teams were happy to play some form of rugby. Coventrians took the lead after the home defence missed several tackles but Alcester retaliated with increased pressure which twice brought them close to a pushover try. However, it was from a lineout the home side levelled the score when flanker Alec Aucott crashed over. The opposition’s extra pace put them back in front with three tries in quick succession to open a healthy 22-5 lead which was somewhat harsh on Alcester. The Kings Coughton men were winning every scrum but were unable to capitalise as poor game management saw the team elect to run rather than keep the ball in the scrum and drive on. Eventually a score came from a scrum near the visitors’ line. Alcester pushed them to within two metres of the whitewash and number eight Matt Jupp picked up and drove over to make it 22-10 at half-time. In a scrappy start to the second half, Coventrians were first to score again and then five minutes later were adding to their points tally with another kick and chase try. Jupp crossed for his second try of the game but a mistake on the left wing allowed the Coventrians winger a free run to the line from inside his own half to finish the scoring. Alcester 2nds visit Manor Park 2nds on Saturday.